Many members, although aware that a tap is used to cut a thread in a hole, may not know the correct way to actually use one. Taps are made from hardened and tempered cast steel and, in the smaller sizes, are extremely brittle and easily broken. Where a broken tap could jeopardise the whole job, it is good practice to drill the hole slightly larger and accept a shallower thread, if the nature of the work permits. Taps normally come in three types, Taper (which is used for the first cut), Second and Bottom. Often only the Taper and Bottom taps are used quite satisfactorily but if the job is critical and would cause great problems if it went wrong it might be advisable to use all three taps (if they are available). After drilling the hole, select a tap wrench, that will not give too much leverage and tighten it on the taper tap so that it will not come loose when in use. Never attempt to tighten the wrench with the tap in the hole, it will almost certainly result in a broken tap. Enter the tap in the hole and turn forward and backward, taking great care to keep the tap square to the face and in line with the drilled hole. If the surface is not large enough to test this squareness with a try square, get the assistance of another person to sight the tap from the side; the operator himself can sight from the front. The backward turn is to break the cuttings and ease the next forward turn. All material except cast iron and brass require the use of a cutting oil. Lubricating oil eases the process but does not assist the cutting action. The value of the use of cutting oils and pastes has to be experienced to be appreciated. If the hole to be tapped is a through hole, the taper tap may be screwed straight through and the second and Bottom taps will not be required. If the through hole is a long one, however, then difficulty may be found in screwing the taper tap straight through, because the tap will tend to jam; if 'you persist then tap will break. As soon as the taper tap begins to jam, remove it and use the Second tap, and when that tightens use the Bottom tap. 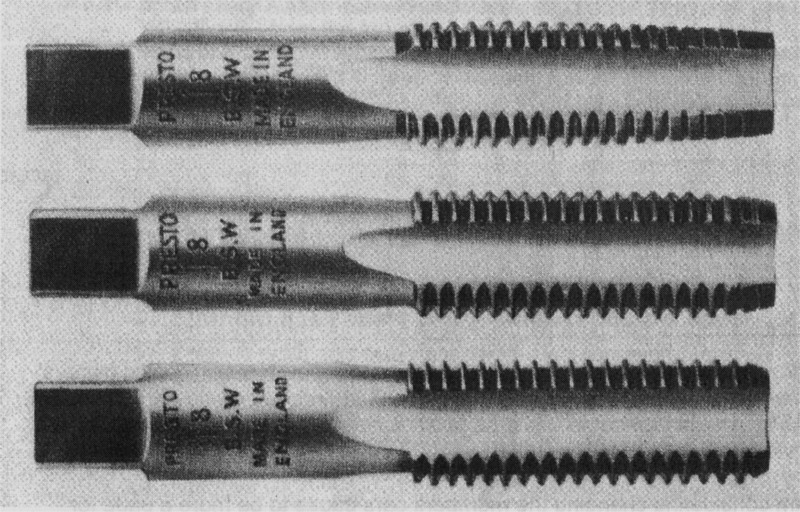 Repeat the use of Taper, Second, Bottom taps until completion. If this procedure is adopted, tapping will be made easier and the danger of breakage considerably reduced. The same procedure is adopted with blind holes, great care being taken not to screw the tap hard against the bottom or again it will be broken. Before completing the tapping of a blind hole it may be necessary to clean out the swarf from the hole several times, and at the same time wipe the tap clean. Short blind holes present further difficulties. To start and finish a thread in a short distance requires great care, since it may not be possible to use the taper tap at all, as this will merely ream out the hole. Starting with the Second tap is of course more difficult, especially to start it square. To overcome this, the job should be left in situ after drilling and the tap fitted into the drill chuck, carefully pulling the drill spindle forward and backward. Always maintain an even torque or twisting force, and a better 'feel' can be obtained with small taps if the job as well as the tap and wrench is held in the hands. Taps broken when tapping holes can be a problem and are most difficult to remove. Tap extractors are available and are effective on large sizes. It is sometimes possible to break out the tap with a small chisel or punch or even screw it backwards out of the hole. On some occasions the broken piece may be driven out from the other side, especially if it is the end of a taper tap. Depending upon the job, it may be possible to soften the tap by heating with a fine blowpipe flame and then carefully re-drilling. If, however, the tap is broken in cast iron, great care must be taken with the heating, as local heat may crack the casting. See also 'Austin Seven Threads' researched by Peter Kemp and which appeared in Focus, Jun 2001 pp20-25. This article, written by Malcolm Watts, originally appeared in CA7C Seven Focus Mar 2002 pp24-25.